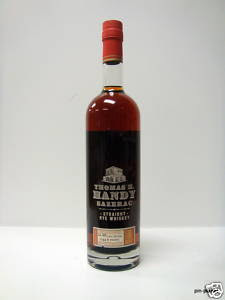 Winner of Gold at the 2005 San Francisco World Spirits Competition. This whiskey is aged between 12 and 25 years, and is matured exclusively in seasoned Bourbon barrels. 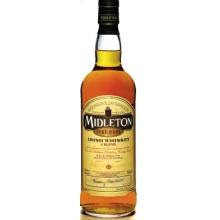 Midleton Very Rare was launched in 1984 to celebrate the whiskeys of the Midleton distillery, and a new vintage has been released every year since then. Each bottle carries its own individual number and the signature of our Master Distiller. This annual release of a new vintage is a departure for the whiskeys of Irish Distillers where consistency from year to year is highly valued. The individual nature of the selection process for each vintage of Midleton Very Rare means that each year’s vintage provides its own character. 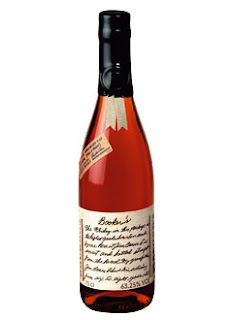 In 1988, Booker Noe introduced his own signature bourbon, Booker's True Barrel Bourbon. Inspired by a 200-year-old tradition, Booker's is the only bourbon bottled straight-from-the-barrel, uncut and unfiltered. First created as a holiday gift for his special friends, Booker's whiskey was so well-received that he decided to make it available to bourbon lovers worldwide; much to the joy of spirit connoisseurs everywhere. Booker's is the rarest, absolute best bourbon available. Booker's Bourbon is the only uncut, unfiltered, straight-from-the-barrel, connoisseur's sipping bourbon available today. It's bottled at its natural proof of between 121 and 127, and aged between six and eight years. Booker Noe, Jim Beam's grandson and master distiller emeritus, hand selects each barrel that will become Booker's Bourbon. Each barrel that will become Booker's bourbon is aged in the very center of the rackhouse where the temperature and humidity combines in the perfect proportion for the finest bourbon. This is truly the absolute best bourbon available. Comments: "A tasting of Small Batch Bourbons left me in awe of Booker's." - The Chicago Tribune"
"Any crispier and the glass would shatter: hard as a diamond rye, but oh! So much more of a rare and valuable gem! For the price, this is all sorts of Spice and nice! Incredibley complex and yet affordable. This bottle packs a punch, but for a beginner it is more approachable then lets say, George T Stagg. The Stagg is incredible at 141.4 proof, however this is little lighter on the proof and has a smooth finish easy on the burn. This Rye Whiskey is a must taste and loved by all the Bar Bandits! "Notes: This is the first release of the Thomas Handy Sazerac and a new addition to the Antique Collection. If you can find any I suggest you grab it now it will probably be a collectors item. Production was very limited - less than 1/3 the number of barrels than the George T.Stagg. It is the only barrel-proof rye on the market today. First Impression: Rye, allspice, fuity spiciness, saddle leather notes. Damn solid- most whiskey this high a proof would start to burn the nose, this one teases it. Taste: Nice medium/heavy body and mouth feel generating warmth wherever it touches with a spicy sourness underlying. Like a very intense almost essence of rye bread. Lingering spicy oak dryness. Remarkably smooth fpr a overproof whiskey - possibly dangerously so." I am not one to usually associate fruit with my whiskey; however, I can be wrong. One might stop and ask, "How do they cram so much peach flavor into this bottle and still have room for whiskey" after drinking from this bottle. This is a great whiskey for after dinner, to pour over Ice cream, to glaze a peach cobbler, or just to sip and enjoy. You will still taste whiskey while you also enjoy ripe round fruit flavors of peach, apricot, a slight hint of fig, finished with a whisper of spice brought over the top from the whiskey it's self. I have tasted the Leopold's products and I have been impressed every time. "Deep burnished copper color. Mashed baked peach, custard cream, and talc aromas. A thick syrupy entry leads to a tangy, viscous medium-full body of baked peach puree, prunes, and light peppery spice. Finishes with a tangy peach and apricot tart flavors with lime and mineral accents. Great pure, natural flavor-try with Asti Spumanti or prosecco for a killer Bellini cocktail." Light candle wax, with some sugar. A faint floral fragrance. Wax comes up with water - scented candle wax. Dried flowers on a beach. Later, brown sugar. Pleasant mouthfeel, not as waxy as some expressions; maritime generally. Some salt in the aftertaste; dryish, even slightly bitter finish. "Scotch Malt Whisky is made in pot stills from just water, barley and yeast. It is a complicated procedure but basically the traditional method is as follows. Barley is steeped in water for two or three days, which causes it to start germinating when it is then spread on a maltings floor. Heat is given off and the barley is regularly turned with wooden paddles called shiels to enable even development. Starch in the barley grains turns to sugar over about 12 days, at which time germination is stopped by drying in a kiln. Usually part at least of the drying is by peat-fuelled fires, the smoke from which imparts smoky, peaty aroma and flavour to the malt and the final whisky. This is called peat reek and can be light or very heavy according to the chosen style. 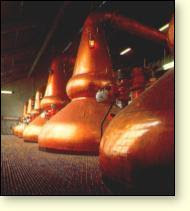 However, one distillery, Glengoyne, closes off the kiln-smoke from the malt so that no smokiness goes into the whisky. The dried malt is ground into grist and mashed (mixed) together with hot water to make a sugar-rich liquid called wort. It is drawn off and the solids left behind are collected for use as cattle feed. (Quite a few distillery herds have won Supreme Championships at Smithfield over the years.) The wort has yeast added to it, which then ferments over two days into a weak ale called wash. Most pot-still whisky is distilled twice so stills tend to be grouped in pairs comprising a wash still and a spirit still. There are a few distilleries where a third still is used either to allow more complicated production methods (e.g. Springbank) or for triple distillation (e.g. Auchentoshan). With double-distillation, the wash is loaded into the wash still which is heated (sometimes with a naked coal or gas flame, usually these days with internal steam pipes) to slow boiling. Alcohol vapours boil off, pass over the still’s swan-neck and condense (rarely now in a ‘worm’ immersed in cold water, usually in a modern condenser) to a liquid, called low wines. The low wines are then loaded into the spirit still and distilled a second time. As the distillate begins to run off, the early part is unwholesome and steered to a side tank by the stillman watching the liquid pass through the spirit safe. At the right moment, he diverts the flow and collects the next part of the run in the main container which is called the spirit receiver. The stillman must continue to watch because while the liquid runs off the still, its alcoholic strength gradually drops. When a fixed strength is reached the flow is once again turned away to the side tank until it peters out, almost as water. The ‘middle cut’ – the ‘heart’ of the run that was collected in the spirit receiver – is the clean, wholesome distillate which goes on to become whisky. Nothing is wasted. The foreshots and feints that were collected separately are added to the next batch of low wines and distilled with them. Scotch Grain Whisky is made in continuous stills from assorted unmalted cereals and a proportion of malted barley. The unmalted grains are cooked so that the starch cells burst open. When they are mixed with the malted barley to make a mash, the starch turns to sugar and a wort is created as with malt whisky production. The fermented wash is fed in a constant flow to a patent still which completes both the evaporation and condensation processes within its analyser and rectifier columns. As long as wash is fed in, spirit comes out at the other end. The grain spirit is produced at much higher strength, making it smooth in texture but faint in both flavour and aroma. Both malt and grain whisky must age in oak casks for a legal minimum of three years, but in fact most ages for much longer. The majority of single malts mature for between eight and 16 years, and 12 years is widely used as the bottling age for both malts and good de luxe blends. If an age is declared on a label it refers to the youngest whisky blended or vatted in the bottle. During ageing, whisky loses its youthful fieriness and takes on flavours and aromas from the cask. Vanilla and a pleasant oakiness are two such, and, if the cask has previously held sherry, sweetness, toffee and sherry flavours may also come through. With a range of characteristics on call, the best whiskies achieve a balance of mellowness, complexity and completeness that is most attractive. Blended Scotch assembles the best degrees of whisky’s richness, flavour, aroma, texture, mellowness and strength without the more daunting extremes of pungency, concentration, high strength, ultra-smokiness or blandness. Blended Scotch has nothing in common with, say, blended wine or blended whiskey from other countries where something acceptable is made out of constituents that are unbalanced or flawed. Most of the whiskies used in blended Scotch are available as self whiskies in their own right. Good blends have from 45% to 60% malt content and the skills needed to assemble perhaps 45 different whiskies to make a single consistent blend are considerable." How Bourbon Is Made a Little History.